«« previous: Anthony Riding a Horse, Bike, and More…. 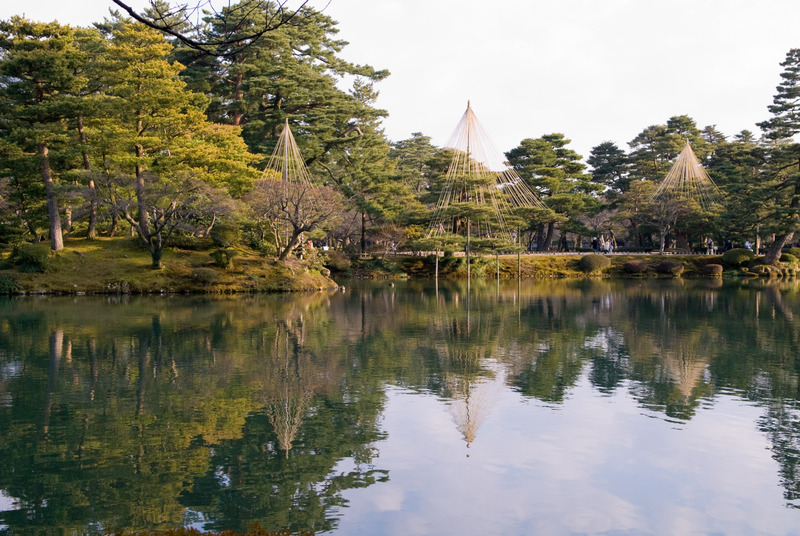 As I mentioned earlier, we made a short trip to Kanazawa the other day. 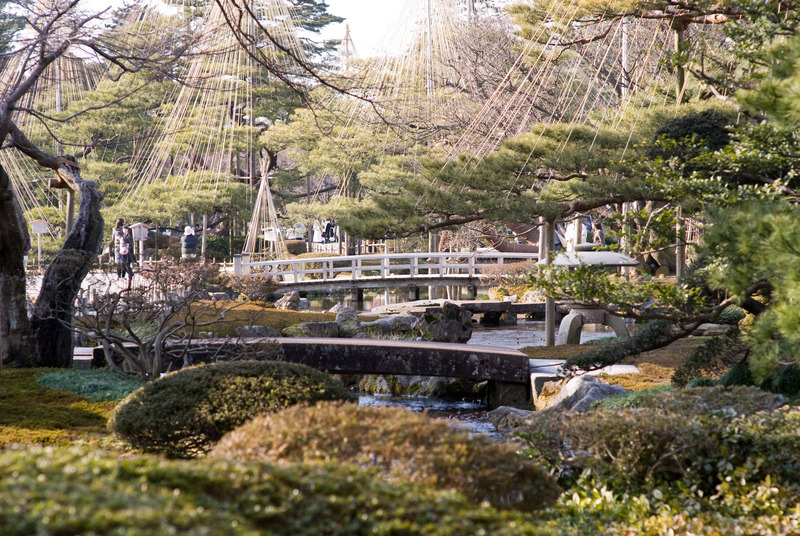 Among the area's attractions are the Kenrokuen Gardens one of the so-called “three famous gardens” in Japan. It dates back to the 1600s, although its present state was formed later, in the mid 1800s. It's famous for its beauty in the snow, and according to pictures I've seen it's pretty amazing in the spring, summer, and fall as well. Early march – with no snow and no flowers – is perhaps not the best time to visit, but we enjoyed it nevertheless. 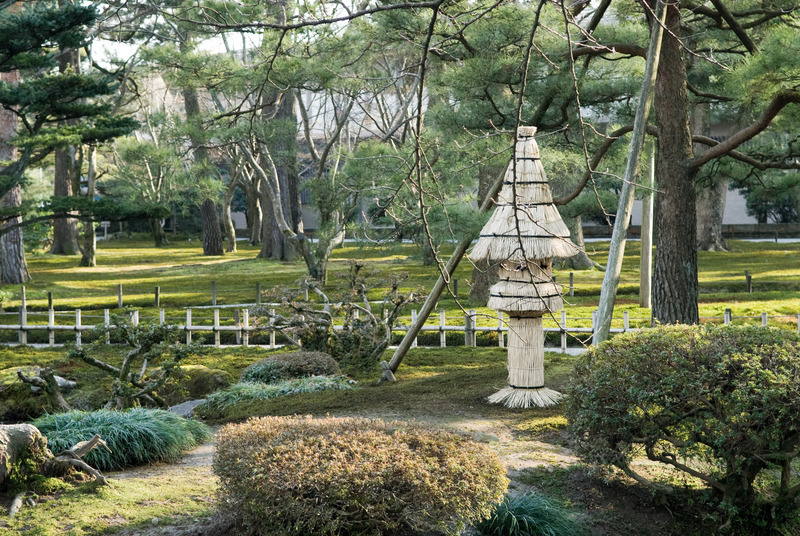 Throughout the gardens, as everywhere in Kanazawa, most pine trees (and many kinds of larger plant life, for that matter) are adorned with bamboo and twine in various configurations, ostensibly to protect the tree from damage due to heavy snow. The most common method is a tall central pole of bamboo, with ropes of twine running out to the branches. As the branches grow heavy with snow, the ropes and pole help support the weight. I suppose that's a stone lantern under cover. On either side of it, you can see two large posts supporting the large pine tree next to it. 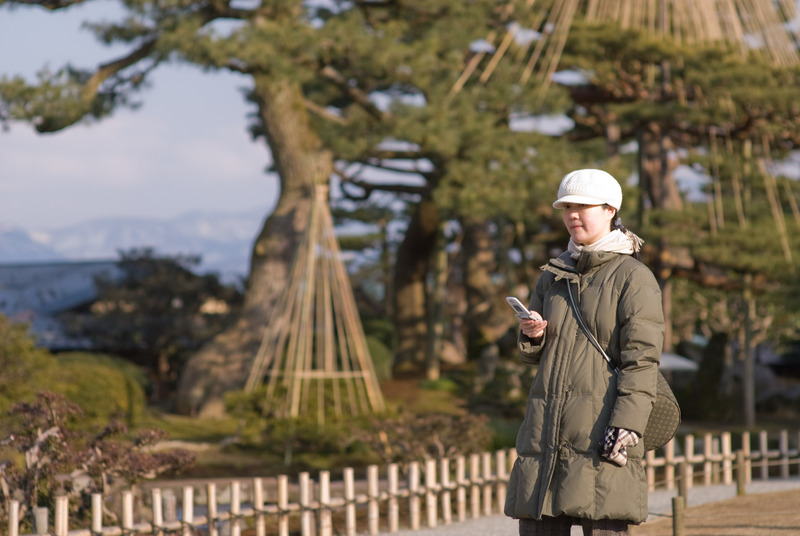 Oddly, we didn't see any of the tree snuggies that are so common in Kyoto. Upon arrival in Kanazawa and seeing these kinds of things absolutely everywhere, it becomes clear that all these botanical accoutrements are often more for their form than their function. They've made quite an art out of it over the years, although the ones seen in the Kenrokuen Gardens are on the simple, subdued side of things. We had time to see only a small part of the gardens, so if we ever go back during a more “in season” season, I'd plan for a lot more time to explore and enjoy. 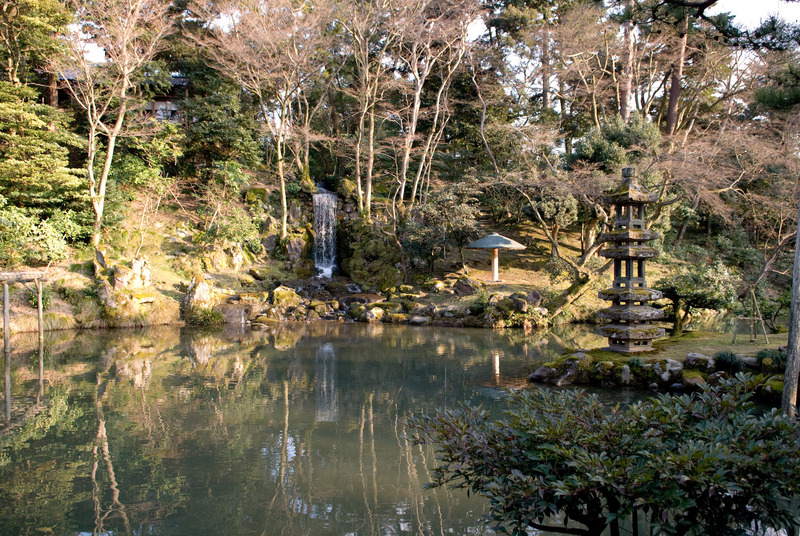 Still, there were plenty of calm, serene areas to enjoy. The support for the branch above is likely required for the heavy burden of blossoms the tree will have in about a month. 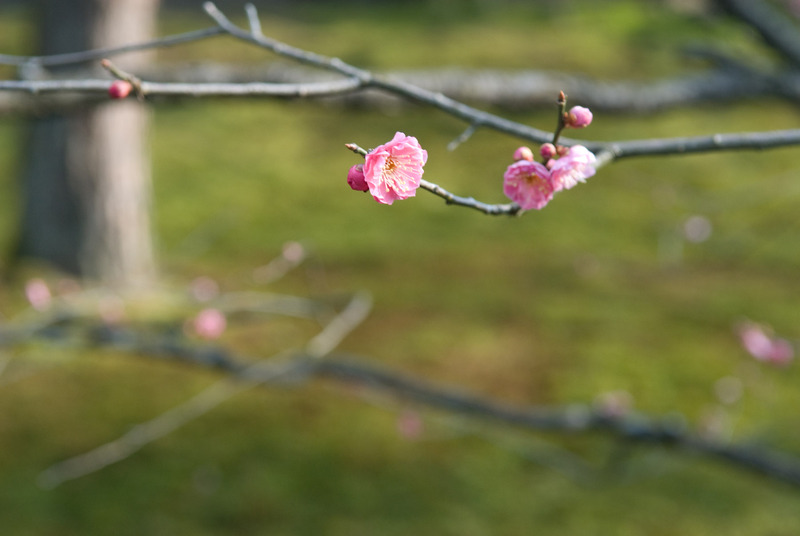 Thanks for identifying those “first deep pink plum blossoms”. The part of Slovenia where I live is covered with blossoming fruit trees (cherry, plum, apricot, etc.) and I can never remember which ones appear first. They’re all gorgeous, of course, but I do like to know what I’m admiring. Though I’m enjoying everything you post, I’ll be looking forward to the explosion of sakura in the next few weeks! 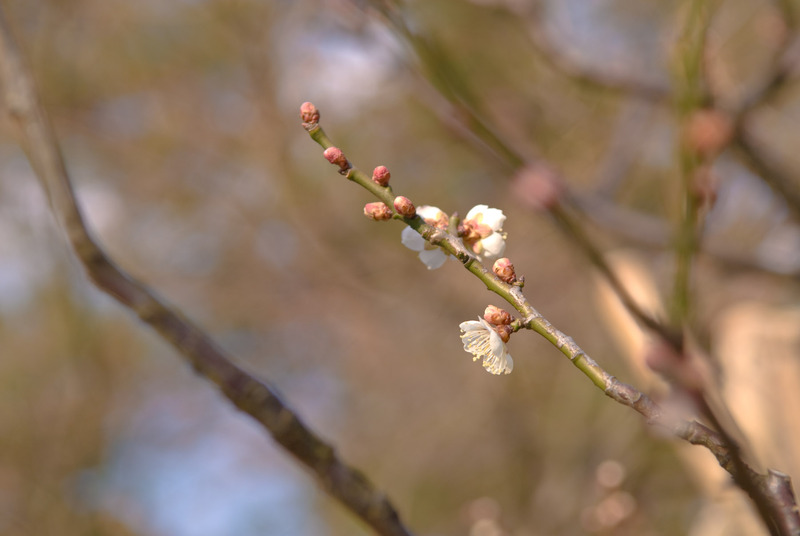 Japanese plum is not the large-fruited sweet plum (Prunus domestica) that we grow in the West, but is Prunus mume, also called Japanese apricot. It flowers earlier than “our” plum, has beautifully sweet-scented flowers, and small, finely downy, sour fruits that are preserved with salt as umeboshi; also dried. 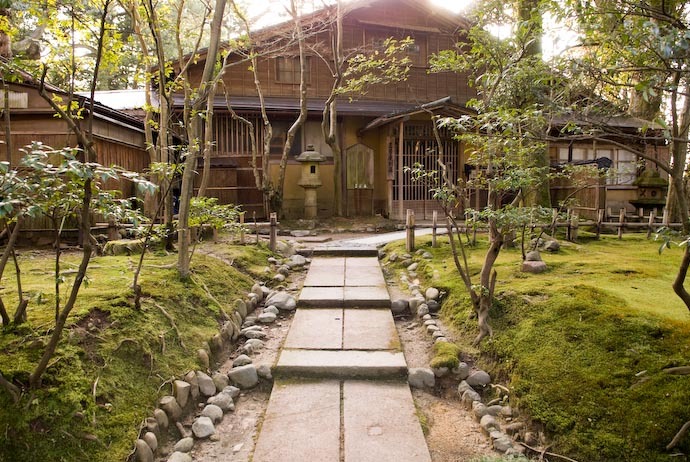 I understand that two ‘lines’ of varieties have been developed over the centuries, mi-ume cultivated for their fruits, and hana-ume, for garden decoration. The downy fruits distinguish apricots from plums. It is a beautiful small tree, flowering earlier than most of the Japanese cherries, and its simple, round-petalled flowers are often depicted in Japanese woodcuts, printed fabrics, and so on. Although cultivated in Japan since the 7th century or earlier, it originated in China. For the record, I don’t know all this, of course! It is mostly derived from a wonderful book called rather ponderously ‘History and Principle of the Traditional Floriculture in Japan’, by Seizo Kashioka & (my erstwhile colleague) Mikinori Ogisu. 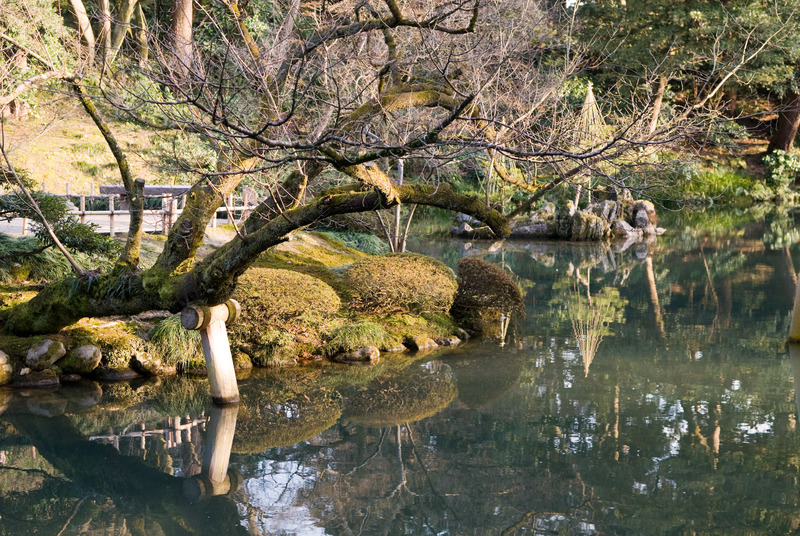 Lovely to see this garden; I also much enjoyed your friend Katsunori Shimada’s plum blossom shots from a few days ago. Very earth toned images. Green and brown, full of life and death. That might be too deep. Is that what they do? I read the struts are there to support certain trees under the weight of winter snow? 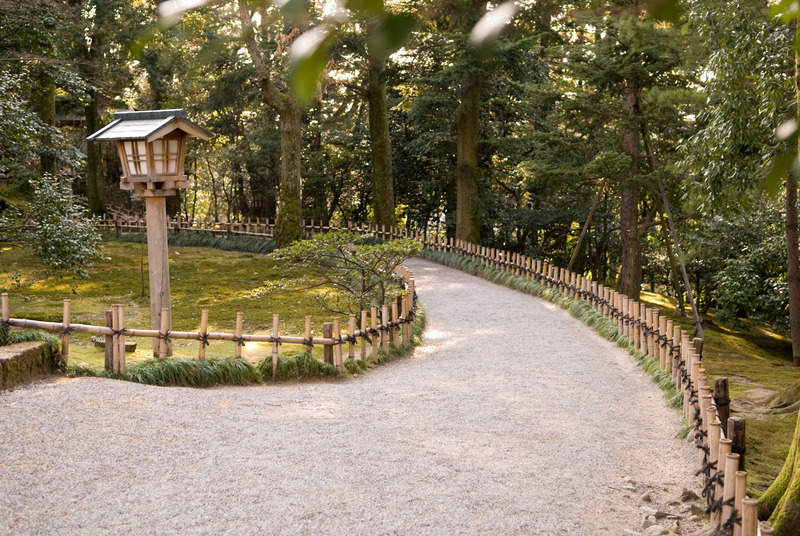 I was a little underwhelmed by Kenrokuen too I must admit. I was there in the height of Summer thought. I’m sure that it would be more impressive at other times of the year. OK, Peter taught me something new for me about “ume”. Lucky to have such a knowledgeable commenter. Thanks, Peter. 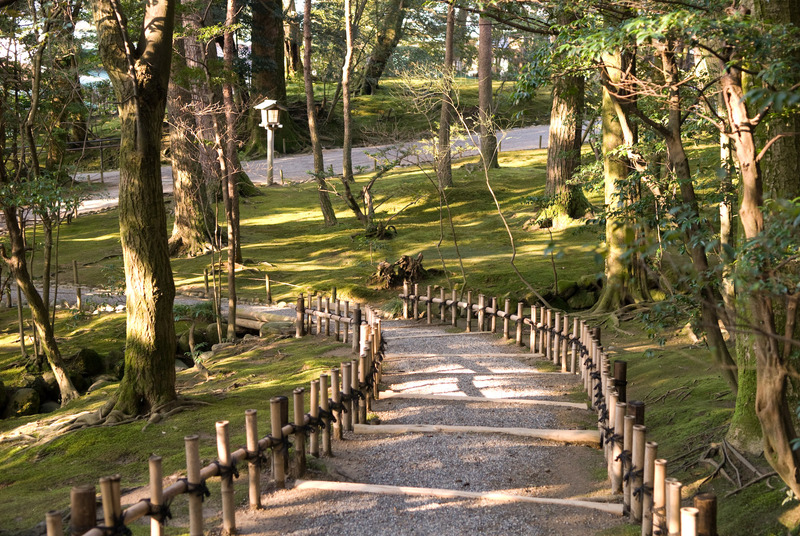 Hi Jeff, Lovely photos of Kenrokuen Gardens. I think the severe pruning of the trees, and poles to support branches is because some of the trees are hundreds of years old and Japanese practice is to save the tree. The supports are to stop the branches breaking under the heavy weight of snow and further damaging the ancient trees.The trees still flower prolifically the following season despite the prunings. The cherry blossoms were in full bloom when I visited, so it was very pretty.